The Atlantic Philanthropies recently supported an in-depth research study called “Out of School and ‘On the Wall’” conducted by the Center for Research on Fathers, Families and Child Well-Being at Columbia University in New York. 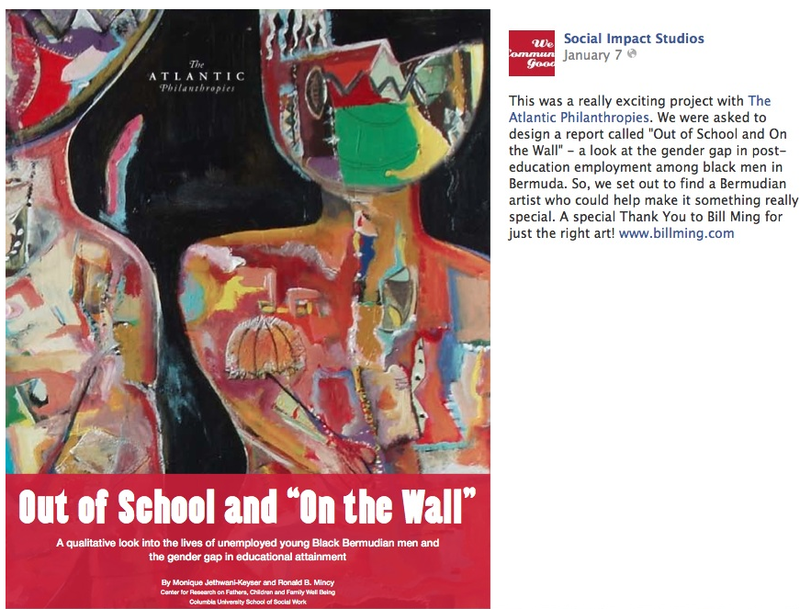 The completed study was produced for publication by Social Impact Studios, who turned to Bill Ming for striking and emotional art that could help call attention to the study and the important issues it addressed in Bill’s native Bermuda. Since 2007, the study was conducted in Bermuda to understand the employment and education gaps between Black men and their peers. Among other things, these studies revealed that Black men are less likely to graduate high school or obtain advanced degrees. They earn less than White Bermudian men and are almost twice as likely to be unemployed. In addition to poor earnings and educational outcomes, young Black Bermudian men are also highly over-represented among the incarcerated in Bermuda. The report recommends ways in which public programs might provide a better way for young men to overcome the challenges they experience both in and out of school. Adorned by Bill Ming’s powerful painting “Da Tattoo Three,” the report will be a conversation-starter and advocacy piece to put this issue in front of people who will hopefully be moved to take action for positive change.